The CK-06b Aries Strider was developed second, to offer an option to those pilots used to bipedal frames, and also because we found that the Stalker is a bit big for some environments... Regardless, the Aries Strider is fully capable of performing the tasks one would expect of a combat-fitted Chub. Close ups of the CK-06b Aries Strider. Images show the Lancer configuration fitted with an off-the-shelf SSR launch system. For more information on how to get your new CK-06 Aries Assault Frame, contact your local CK Industries Sales Representative now. Fluff aside, I put these two together whilst trying to come up with a relatively small (the Strider is nearly a brick shorter than my custom Chub) frame that also isn't full of articulation (I keep wanting to have everything articulated). The Stalker was probably one of the quickest builds I've done. The Strider has taken months to come up with decent legs. 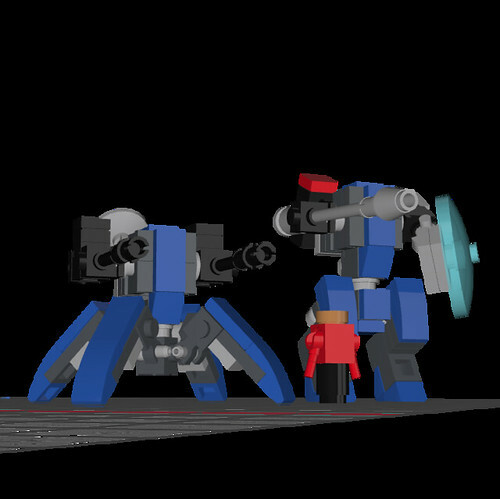 The ones it has now are inspired by the legs on HyveMynd's unnamed biped frame. They're both fairly sturdy, and the Strider is also quite stable - I have one in the brick in a similar pose as the image above, it only falls over if I accidentally hit it when trying to use my PC (I have LEGO all over my desk ). Those are some nice frames. They look like they'd be 4p scale to me. HyveMynd wrote: Those are some nice frames. They look like they'd be 4p scale to me. That would probably be a better scale for them, they would (like the Squidges) be very tight to fit someone in at 7p! I really like all these small quads that have been showing up lately. I may have to develop a few of my own. Quads are great game pieces since there's never any worry about falling over regardless of the pose, loadout, or table surface. The Stalker's legs have been lengthened to help accommodate the increased cab size (though the original sized legs can still be ordered for those who prefer them). For more information on how to get your new large size CK-06 Aries Assault Frame, contact your local CK Industries Sales Representative now. Small size CK-06 Aries Assault Frames will continue to be sold, for those with a tighter budget. Slightly modified the torso to make it seem more likely that a 7p human could fit into the cab of these, after HyveMynd mentioned that they looked more 4p than 7p. I had to up-scale the Strider's legs as the original ones seemed a bit too short. Could we get more angles on the larger cockpit frames? I really like the evolution that you have going here and I'd like to a take a closer look. Jay Biquadrate wrote: Could we get more angles on the larger cockpit frames? I really like the evolution that you have going here and I'd like to a take a closer look. Certainly, it'll be this evening (UK time, we're about 5 hours ahead of the MF0 forum clock) before I can do it though. This is a really nice, compact core. It looks very useful as the base for a standard, mass-production-type frame. Jay Biquadrate wrote: This is great. Thank you so much. Can I just say, I love the Picard pilot. "Ready to launch Riker's Raiders Captain." The Hydromancer wrote: Can I just say, I love the Picard pilot. That was completely unintentional, I just picked some random colours that contrasted well with the frames. But I can totally see it (and now I always will).